Accessible parking spaces are available in the High Street parking lot directly across the street from ​Rupp Arena. Vehicles which park in the designated accessible parking ​spaces must display either the temporary hang tag or a permanent state license plate with the ​accessible parking notations. All parking in these spaces is on a first come, first served basis. Accessible seating is available for purchase through the Lexington Center Ticket Office (859-233-3535) or through Ticketmaster (800-745-3000 or www.ticketmaster.com). We highly recommend patrons contact our ticket office directly, as our staff is more intimately knowledgeable about our facilities and we feel they would provide the best service for our patrons with accessible seating needs. All patrons entering Rupp Arena must have a valid ticket to gain admission. An exception is made for some shows for children one to two years of age. Please check with our Ticket Office prior to attending the event. For the safety and courtesy to all our guests, aisles must be kept clear at all times. Please follow the directions of the usher assigned to your section and refrain from sitting or standing in the aisles. Guests are not permitted to bring in any outside alcoholic beverages, nor are they permitted to leave the building with alcohol purchased inside Rupp Arena. Alcoholic beverages may be purchased inside the arena at most events. All alcohol purchases must be accompanied by a valid state issued driver’s license or ID, Passport or Military ID. You must be 21 years of age to purchase any alcohol. Service of alcoholic beverages is limited to two (2) drinks per person, per purchase. Management has the right to refuse service at any time. Alcohol sales can be terminated at any time at the discretion of Rupp Arena management. There is an ATM located in the Shops at Lexington Center on the first floor near the Food Court, and another ATM located inside the arena on the Whitaker Bank Concourse across from Section 11. The baby changing stations are in the family restrooms located on each main concourse. Signs which are hand-held and no greater than 24" x 24" in size are allowed at most events. Signs may not be hung or fastened anywhere in the arena. Small signs should not be commercial or obscene in nature or cause any disturbance with other fans. Rupp Arena reserves the right to remove any banner or sign without exception. Guests are welcome to bring their own binoculars to events at Rupp Arena. Binocular rentals are not available. If you seat is not functioning properly or broken, please notify a member of our Guest Services staff for assistance or contact us directly at 859-233-4567 Ext. 100 with the exact location of the damaged seat. Cell phones, tablets and laptops are currently allowed in the arena as long as their use does not interfere with other guest’s enjoyment of the event or activity. No devices can be plugged into the buildings electrical outlets. The admission policy varies by event. For most events, a child under the age of 2 does not require a ticket with the exception of UK events in which every patron, no matter their age, must have a ticket. Please check with the Ticket Office at 859-233-3535 for the age requirement for tickets for the event you are interested in attending. Rupp Arena honors Visa, MasterCard, American Express and Discover. Driving directions, including maps, are available under the Plan Your Visit section of this website. Rupp Arena offers a drop-off and pick-up area on High Street/South Side of the arena. Limousines, buses and cars will be allowed to drop-off and pick-up in this area, but no vehicles will be permitted to park there. Rupp Arena has two passenger elevators available from the concourse level. The main elevator is behind Section 15 on the east concourse. A second elevator is located on the west concourse behind Section 30. Please note that there are some events which do not allow patrons to use the elevator. Guest Services personnel are on or the elevators during events and will communicate accordingly. Rupp Arena is committed to providing the highest standard of safety for our visitors and employees. In case of an emergency, please follow the instructions of the staff and proceed to the nearest exit and out to street level in a calm and safe manner. Click here to view the Evacuation Map. Guests should use the stairwells as a means of evacuation. Elevators and escalators may not be working at the time of an evacuation. The emergency phone number for Rupp Arena / Lexington Center is 859-233-4567. The call is taken by a member of the staff and relayed to our Guest Services staff that then relays the message to you in your seat (if that information is provided). Please be sure to leave your section, row and seat number with any person(s) who may need to reach you at the event in case of an emergency. This is the only way our staff will have to locate you. Please note that we cannot make any announcements during the event. Patrons will be contacted in emergency situations only. Rupp Arena will utilize walk through metal detectors at most events. Upon arrival, fans will be requested to remove items like cell phones, keys, bags/purses and large metal objects that may set off the alarm, thus requiring further inspection. Although these units are more effective and faster than handheld metal detectors, patrons should still plan to arrive early to events in order to avoid standing in long lines. A special “Express Lane” will be set up for patrons entering the arena without purses or bags. The time that doors open prior to an event will vary, but most of the time it will be one (1) hour prior to the event time printed on your ticket. Family restrooms are located on the East Concourse to the left of the concession stand and on the West Concourse to the right of the concession stand. Certified medical professionals are available at our First-Aid station during most events to assist guests with medical needs. Guests in need of emergency first-aid should contact the nearest Rupp Arena employee for assistance. The primary First-Aid station is located on the main concourse near section 34. Please visit our Concessions Guide page for information on food and beverage services. Guests may not bring in outside food and/or beverage. Guests with specific/dietary needs due to medical conditions or religious requirements should contact Guest Services at (859) 233-4567 Ext. 100 prior to arrival. Select events at Rupp Arena offer discounts to groups. Please call Jana Hatton at 859-787-0920, email [email protected] or go to our group sales page for more information. In order to provide all guests a positive and enjoyable experience when attending events at Rupp Arena, we ask all patrons to please be respectful and considerate of their fellow event attendees. Disorderly Conduct: Guests who fail to follow the policies set forth by the management of Rupp Arena / ​Lexington Center and enforced by its staff or those who violate any local, state and/or federal law will be subject to ejection from the facility. Ejection from Rupp Arena: ​Disruptive or problematic guests should be reported to event staff immediately. Guests asked to vacate the arena may be escorted from the premises by event staff, security, facility management or local law enforcement. Firearms/Weapons: This Facility is within a “School Zone” (18 U.S.C.922) Firearm Possession is Prohibited except for those Authorized to carry weapons by the Commonwealth of Kentucky. Intoxicated Guests: Intoxicated guests are not admitted into Rupp Arena at any time. Intoxicated guests are subject to removal from arena property. Patron Appearance: ​Patrons entering Rupp Arena must be properly clothed, which includes shirt and shoes. ​Clothing items must be worn at all times inside the arena. Projectiles: ​The throwing of any object at any time inside the arena is strictly prohibited. Any person ​witnessed throwing a projectile of any size is subject to ejection from the facility. Guest Services has a location at each entrance into the arena to assist patrons regarding general inquires, seating questions, ticketing issues, accessible needs and assistance as well as information regarding future events. Guest Services is open beginning 30 minutes prior to doors opening for an event and remains open until the building is clear of all patrons after the event has concluded. Guest Services staff including ushers, ticket takers and security is available to assist patrons throughout the duration of the event. Guest Services can also be reached in advance to assist with any question or concern you may have at 859-233-4567 Ext. 100. Sign Language Interpreters are available for the deaf and hard of hearing. To ensure proper service and scheduling, please contact our Ticket Office at 859-233-3535 a minimum of fourteen (14) days prior to the event to request this service. If you lose or find an item during an event, please proceed to Guest Services for assistance or contact our lost and found department which is open 24 hours a day at 859-233-4567 Ext. 100. Rupp Arena is not responsible for lost items. Found items are retained for 30 days. If you get separated from one another, children should be instructed to ask anyone of our Guest Services staff (easily identified by their yellow jackets) for assistance. Lost children will be escorted to one of the Guest Services stations located at one of the entrances to the arena. Parents looking for a lost child should go to this same location as well to request assistance in relocating their child. Event merchandise is generally available for most events and located at temporary stand locations in the arena lobby, East and/or West concourses. Per City Ordinance 198-13, the selling or sampling of food and beverages, selling or distribution of merchandise, tickets or other items on Lexington Center property without written authorization is strictly prohibited beginning three hours prior to an arena event and continuing until one hour after the event is completed. The paging of patrons inside Rupp Arena is not permitted during concerts, shows or other events at the facility. Parking is available across the street from the arena accessible from either High Street or Maxwell Street. Additional parking is also available behind Rupp Arena accessible from either Manchester Street or Main Street. All parking is on a first come, first serve basis. Rupp Arena management reserves the right to prohibit any item from entering the premises. All patrons and their belongings are subject to search prior to entry and once inside the building. *Rupp Arena’s definition of weapons includes but is not limited to the following: knives or blades of any length, metal nail files, chains longer than 6 inches not made of precious metals (i.e. platinum, gold or sterling silver), firearms (authentic or replicated, including toys), clubs or extendable batons, any type of chemical irritant spray, stun guns or Tasers, spiked or studded jewelry, brass knuckle or any other item that could likely be used as a weapon or may cause injury if thrown or used improperly. This Facility is within a "School Zone" (18 U.S.C. 922). Firearm Possession is Prohibited Except for Those Authorized to Carry Weapons by the Commonwealth of Kentucky. *** Diaper Bags may exceed this size requirement, please see Guest Services desk for a visual inspection. Rupp Arena has a No Re-entry policy during events. Guests wishing to return any items to their vehicle must do so before passing through the turnstiles. In accordance with Section 14.97 of the Municipal Code of the LFUCG, the Lexington Center Corporation/Rupp Arena is a smoke-free facility. Additionally, LCC prohibits the use of E-cigarettes, including vaping, inside the arena as stipulated by Lexington City Ordinance No. 171-2003. Please be advised that performances may feature one or more of the following elements as special effects during the event. Call to inquire if you have special concerns. Lexington Center Ticket Office is open Monday through Friday from 10:00 AM until 6:00 PM for advance ticket purchases and to assist with general inquiries. The Ticket Office is also open prior to all events and on Saturday from 10:00 AM until 4:00 PM if tickets for an event are scheduled to go on sale on that day. During daily operation, the Lexington Center Ticket Office is located just inside the High Street entrance of The Shops at Lexington Center, between the Hyatt Regency Hotel and Rupp Arena. During Lexington Opera House events our ticket office will open inside the Short Street entrance of the Opera House beginning 1½ hours prior to show time. 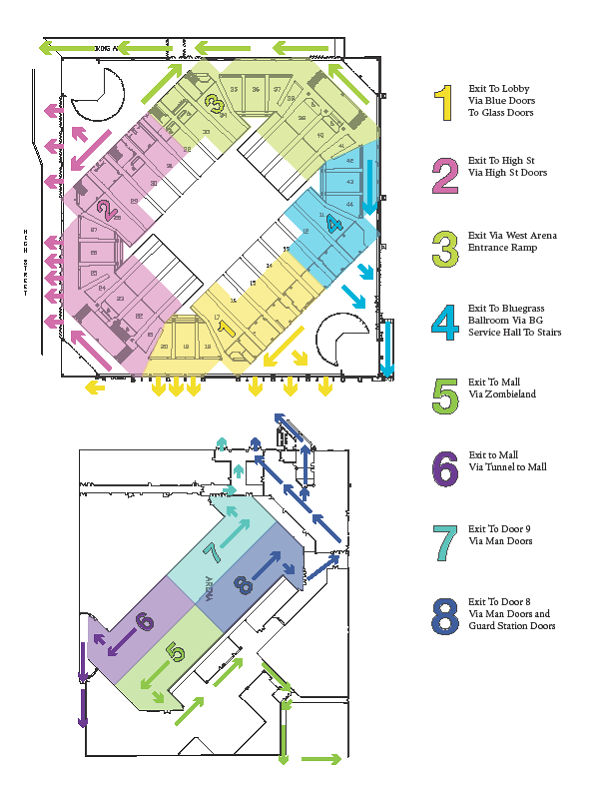 For certain Heritage Hall events, the ticket office is located on Level 1of the Shops at Lexington Center near the entrance to Heritage Hall and/or at the main entrance itself on the west end of Heritage Hall. Lexington Center Ticket Office is able to assist patrons with accessible seating questions and needs. For more information, please contact the Ticket Office staff directly at 859-233-3535 or via e-mail at [email protected]. Tickets to events at Rupp Arena can be purchased at the arena ticket office, Ticketmaster outlets, Ticketmaster Charge by Phone at 800-745-3000 or on-line at www.ticketmaster.com. The resale of admission tickets to Rupp Arena events is strictly prohibited within a 2 block radius of the arena (City Ordinance 198-83, 10-20-83). Rupp Arena does not supply or rent wheelchairs for use while attending an event. If you or someone you are traveling with has mobility challenges, a wheelchair or a mobility aid should be acquired before arrival.